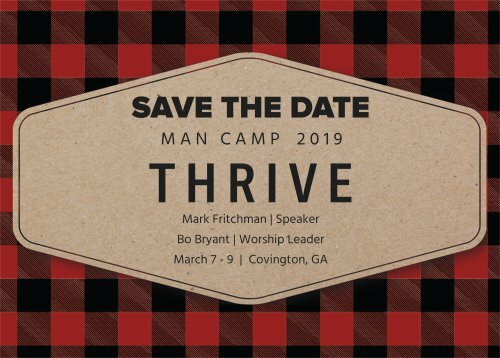 Our men will be returning to the FFA Camp in Covington, GA for the second annual Man Camp! Check in begins at 4pm on Thursday, March 7th, and the retreat will close on Saturday, March 9th. The weekend will include worship, teaching, and small groups, as well as fun activities like golf, archery tag, shooting range, a 5K run, and Man Olympics. Bo Bryant will lead us in worship, and Mark Fritchman will be our speaker. Cost is $150 and registration can be found on our website! If your fist time, do you know anyone going on the retreat? If you are playing in the golf tournament, please do NOT sign up for any other activities for Friday. If you are not playing golf, you can select BOTH the shooting range and archery tag. You can select BOTH of these activities, if desired. We need help running the Man Olympics. Would you be willing to help for a 45 minute time slot? Please include the activities you have previously selected as you check out. If you choose the golf tournament do not sign up for any of the other paid events. They will occur at the same time. Would you like to contribute towards scholarships towards others? Payment will not be submitted now- Jeremy Morris will contact you if you are interested.